Schools across Washington saw a flurry of Safe Routes to School (SRTS) activity this May for Bike to School Month. Students at two schools in particular, Olympic Hills Elementary and Roxhill Elementary, celebrated getting to school using their own power through campaigns that emphasized inclusiveness and creativity. The events provided ways for all students to participate and encouraged them to stay excited about walking to school. Feet First has worked closely with Olympic Hills and Roxhill thanks to a SRTS grant from the Washington State Department of Transportation. We hope these two examples provide ideas and inspiration for those hoping to host Walk to School events this October for International Walk to School Month, or IWALK. Remember, IWALK events can take many forms and can start small! 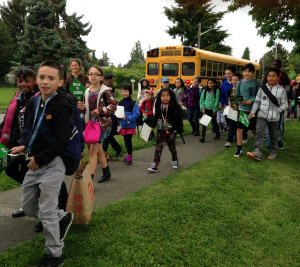 Roxhill Elementary in Seattle’s West Seattle neighborhood organized an All-School Walk Day, which gave students who normally take the bus or drive the opportunity to be involved. District Transportation and Principal Sahnica Washington arranged for a remote bus drop-off at Roxhill Park, allowing students to walk the remaining three blocks to school. The Denny International Middle School Marching Band joined the festivities, marching with students and then playing a number of songs in front of the school while students gathered around to dance and listen. State Representative Eileen Cody and School Board Member Marty McLaren, both neighborhood residents, joined the festivities. The Seattle Police Department and school staff ensured that all arrived to school safely. 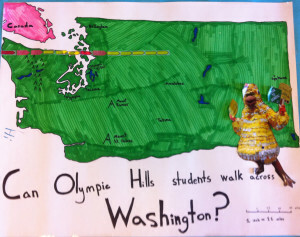 To add an extra incentive to their Walk to School campaign, Olympic Hills Elementary, in Seattle’s Lake City neighborhood, challenged their students to collectively walk the 300 miles across Washington State. On “Two Feet Tuesdays” all the miles from the Walking School Buses and the Before School Walking Club, where students arrive early to walk a lap with Camina the Feet First Chicken, are combined as Olympic Hills inches its ways towards Idaho. Olympic Hills and Roxhill both hosted weekend block parties as a way to connect SRTS programming to the surrounding neighborhood. Roxhill combined their event with a Mother’s Day celebration and had local businesses provide games, food, and music. Feet First partnered with Lake City Greenways and Cascade Bicycle Club for the Olympic Hills Day of Play. The Seattle Fire Department participated as well, providing tours of their fire engine and safety activities. Thanks to Cascade Bicycle Club, both events featured Bike Rodeos and helmet giveaways. Interested in bringing activities like these to your school? It is never too soon to begin planning for October’s International Walk to School Month, IWALK. Access free assistance from Feet First by joining our IWALK Challenge listserv, which will provide you with information and links to put you in good planning position for the fall. Be sure to register your event with the National Center for Safe Routes to School.